This story shows how much the wedding party sacrifices for the bride and groom. While most will not end up in the lake, they will end up spending quite a bit of time and money helping you with your wedding, so make sure you treat them right. Not everyone will feel like being in your wedding is an honor. Make sure that the people you choose are people who will feel honored, not obligated. Consider how responsible each contender is before asking him or her to be in your wedding. You need to know that you can count on your wedding party, and you won’t have time on the big day to do everything that should be done by someone else. 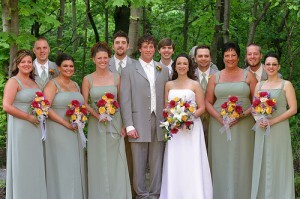 Typically, the wedding party will arrange pre-wedding parties and showers. If you have certain expectations, you can let your maid of honor or best man know, but be careful not to sound like you are being too demanding. Consider pointing them to a timeline or checklist to help them as they plan. Giving your wedding party members a gift is a traditional gesture. One option is to give them something that will help cut down on their expense for the big day. For instance, you can buy all of your bridesmaids matching necklaces and earrings. This will ensure that they have the look you want and will also give them a gift they can keep using after the wedding. You can give them these gifts at the rehearsal dinner, but you may want to let them know your intention so they do not buy something else. Create schedules and send them via email and snail-mail to ensure everyone gets one. If your wedding party members know where they are supposed to be and when, they will most likely do what they can to eliminate stress for you. Also, providing your party with a schedule will reduce the amount of questions you have to answer. Appoint someone who will answer questions for you on your wedding day, such as a wedding planner or your maid of honor. Make sure this individual knows your wishes ahead of time and is able to take care of everything for you. If you need the members of your wedding party to bring things that might be otherwise forgotten, like jewelry or hair accessories, have your maid of honor give them a call the day before. Finally, don’t forget about food. 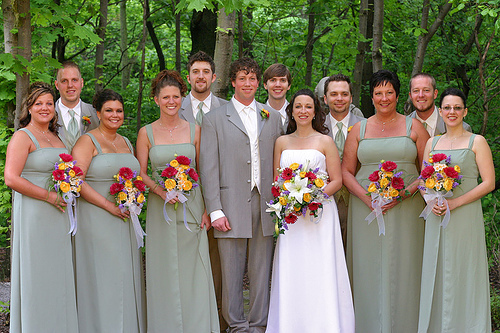 Your bridal party needs to eat, and often the prep time, pictures and ceremony will last for many hours. Have a snack room with finger foods that are not too messy, but which provide a nutritional boost. By choosing the right people for your wedding party, planning ahead for their needs and then sitting back and letting them do their thing, you can enjoy a wonderful wedding with the people you love the most. Just avoid standing on any piers. After all, you and your soon-to-be spouse are the only ones who are taking the plunge!